A license for the Professional Edition, intended for individual use, costs $399 per year. The Enterprise Edition, intended for corporate use, costs $999 per year (although you can buy a five-developer pack for $3,999 per year). Alternatively, you can download an evaluation version that enables development and testing against iPhone Simulator only. Before downloading and installing MonoTouch, you must download the latest release of Mono, the open source development platform based on the .NET Framework that allows developers to build cross-platform applications in C#. You can obtain it from http://www.mono-project.com/. The Mono framework downloads as a disk image file containing a package installer file. 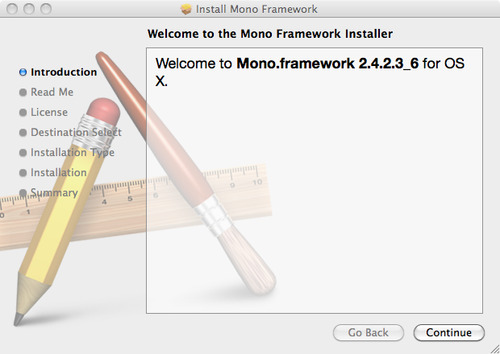 Double-click on this package file to start the Mono installer, as shown in Figure 1. After installing the Mono framework, you need to install the MonoDevelop environment before you can install MonoTouch itself. MonoDevelop is an IDE primarily designed for C# and other .NET languages and you can download it from http://monodevelop.com/; it comes as a disk image, and installation is simply a matter of dragging and dropping the MonoDevelop.app application from the disk image to your Applications folder. You need to use the latest MonoTouch version of MonoDevelop for Mac OS X, as it contains several fixes that are not in the mainstream version of the application. This version is linked from the MonoTouch website. 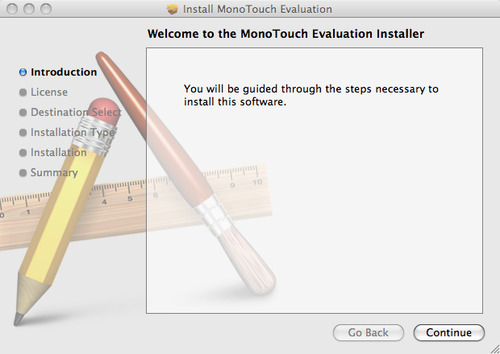 After installing Mono and MonoDevelop, you can download the trial version of the MonoTouch SDK from http://monotouch.net/DownloadTrial. MonoTouch is distributed as a package file that will automatically start the Installer when it downloads, as shown in Figure 2. Double-click on the MonoDevelop application that you installed in your Applications folder, and you will be presented with something similar to Figure 3. Select File→New Solution from the MonoDevelop menu to open the New Solution window (Figure 4). 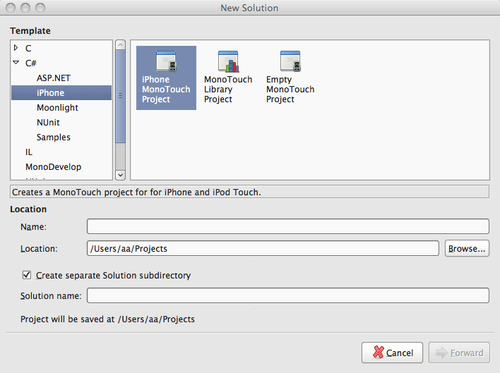 From there, choose a new C#→iPhone→iPhone MonoTouch Project. After entering the solution name, click the Forward button and then the Okay button to complete the setup process. You do not need to choose any of the optional project features (e.g., Packaging or Unix Integration). In the Solution pane, click the disclosure triangle next to the solution name to expand it, and then expand each subfolder in the same way, and you’ll be presented with something that looks a lot like Figure 5. If you select Run→Run from the MonoDevelop menu bar at this point, the application will be built, compiled to native code, and started inside iPhone Simulator. You should see something very similar to Figure 6. Quit from iPhone Simulator and return to the MonoDevelop environment. 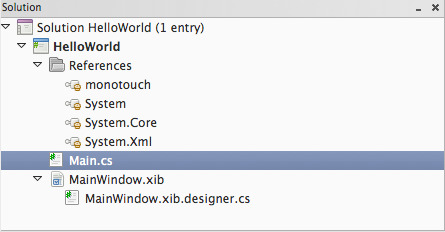 Double-click on the MainWindow.xib file to open the NIB file in Interface Builder. 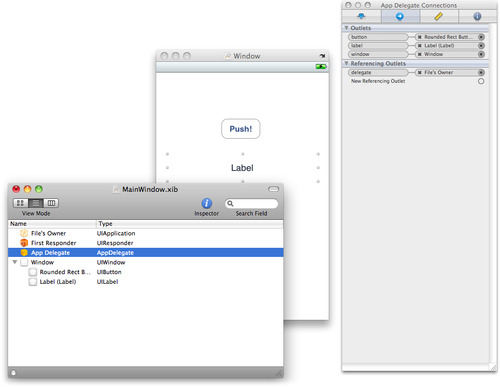 Drag a button (UIButton) and a label (UILabel) into the main view window. Next, click on the app delegate in the MainWindow.xib file and go to the Classes segment of the multisegmented control at the top of the Library window. Click on AppDelegate in the list of objects, and then click on the Outlets segment of the multisegmented control underneath the AppDelegate object. Click on the plus sign button below the outlets list to add a new outlet. Add two new outlets, calling them “button” and “label”, respectively; see Figure 7. In the Connections Inspector (⌘-2), connect the button and label outlets to the button and label elements as you’ve done in other projects. Figure 8 shows what the finished NIB should look like (you can use the Attributes Inspector to change the appearance of the button and label). You should not make any changes to the MainWindow.xib.designer.cs file, as the MonoTouch framework updates it automatically each time you edit your NIB file in Interface Builder. Save your modifications and select Run→Run from the MonoDevelop menu bar. 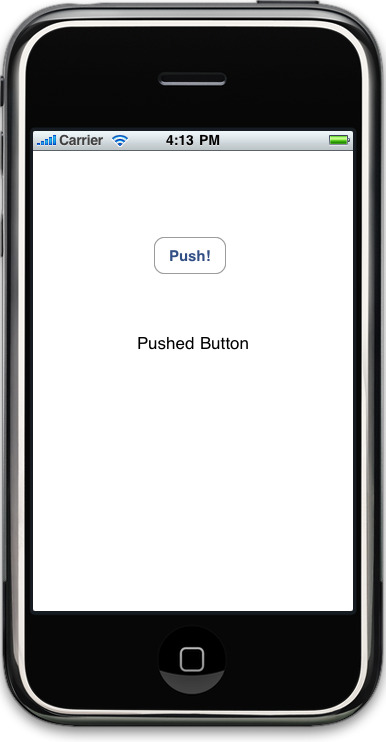 Once the application has been built and been deployed into iPhone Simulator, tap the Push! button. You should see something like Figure 9. You’ve just built your first iPhone application with MonoTouch.